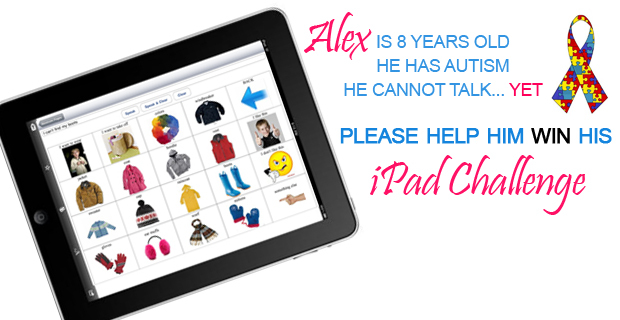 I am asking for your help for a child close to my heart that needs your help to win his iPad Challenge. We need only 60 pieces to be sold in order for him to get a free iPad. Alex is 8 years old, is non-verbal – or I should say pre-verbal . This family has had many struggles including almost losing their home. They have tried so many things and not much has helped this little boy begin to speak. They are losing hope in ever hearing their son speak. It is my hope that with an iPad, they can begin to communicate with their son on a level they have yet been able to. And maybe, just maybe, it’ll help break down that barrier that’s preventing him from being able to talk. Edited 4/7/11 to add: Just wanted to provide some background information about Alex for those who have asked me… They have done SCD, GFCF, etc, IV chelation, supplements and have worked with two of the biggest DAN doctors. Alex has made progress, but has not progressed to the point of being able to speak. We’re hoping that having an iPad will open some new windows for him. Thanks Summer!!! I really appreciate it and I know Alex will too! !